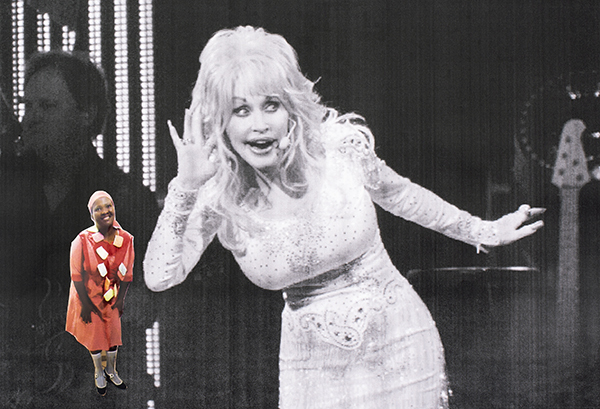 An exhibition by one of South Africa’s most respected artists, Senzeni Marasela, comprising twenty-one works from her series Theodorah and Gebane: Dolly Parton. Marasela produced this fantastic series of ink and photo-collage works on paper during 2017, posting each image on social media upon completion, almost like diary entries. The series, 150 works in total, was almost instantly celebrated by both the art world and on social media. Born in 1977 in Boksburg, South Africa, Senzeni Marasela studied at the University of the Witwatersrand, Johannesburg where she obtained a BA Fine Arts degree in 1998. She has taken part in numerous South African shows and was an artist in residence at Iziko, the South African National Gallery, Cape Town in 2000. In 2002 she was recipient of the Thami Mnyele Scholarship. Selected group exhibitions include Body and the Archive, Artists’ Spaces, New York, 2003; AIDS in Africa, Wesleyan Women’s College, Boston, 2002; Upstream Public Art Exhibition, Umea, Sweden, 2000; Portrait Afrika, Haus der Kulturen der Welt, Berlin, 2000; Translation/Seduction/Displacement, White Box, New York, 2000; Margins in the Mainstream, Namibian National Gallery, Windhoek, 2000; Art Region End of Africa (A.R.E.A.) Listasafn Reykjavikur Kjarvalsstadir, Reykjavik, 2000; Truth Veils, Gertrude Posel Gallery, University of the Witwatersrand, Johannesburg, 1999. Her work features in prominent local and international collections, including MoMA, New York.